The call of our Lego build drew a few visitors to the office this week. The first to arrive and lend a helping hand was Shaun Hack from Chefz Table. 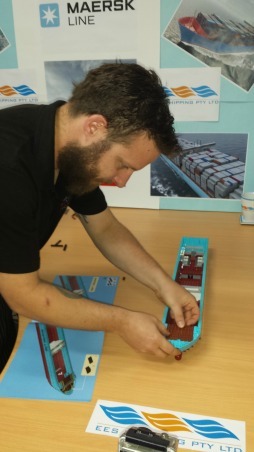 Shaun was excited to help us with a critical part of the hull of the Maersk Mc-Kinney Moller. Shaun consulted the detailed instructions before placing the correct blocks in the right position. We knew that Shaun’s nimble fingers (a byproduct of his job as a chef) would help us with this delicate part of the build. 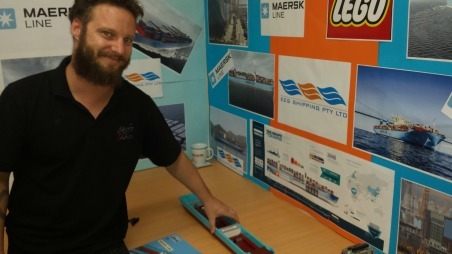 Shaun was amazed that this Lego version of the World’s Largest Vessel was so detailed. As he picked up the model, he commented on how light it was. The actual vessel isn’t light at all, in fact it weighs a staggering 55,000 tonnes – and this is without the ballast water and cargo weight. That’s 55,000 tonnes of pure steel! The next step, which some of us superstitious folk would say is the most important, was to place the gold coin under the mast. 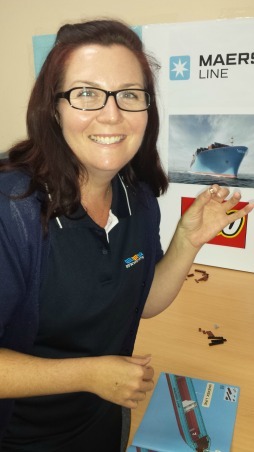 Amanda Bradfield, EES Business Support Manager put her hand up for this task. She has been educating the staff about the history of the gold coin all week. Mast Stepping, as it is called, is a ceremonial occasion that involves welding or placing a gold coin into the mast step of a ship. This ceremony is performed during the ship’s construction and is thought to bring good luck to all voyages. Maersk Line have this coin placed under the mast on all of their fleet. 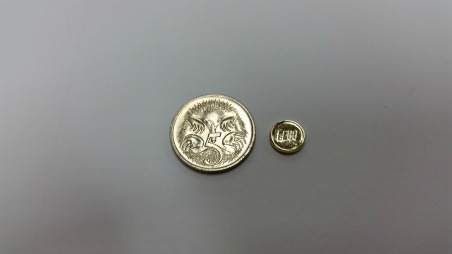 The Lego gold coin is the most tiny, detailed part of this build. We have shown it here against an Australian 5 cent piece so you can see just how minuscule it is. James Parnis, from Accelerate Group, was our final visitor this week. Accelerate Group operate as EES Shipping’s technical support crew. As this was certainly not James’ first time around a Lego model, he quickly finished his contribution of adding the mast footing that covered the gold coin. While we didn’t make as much progress with this week’s build compared to last week’s we did finish the all important mast stepping. 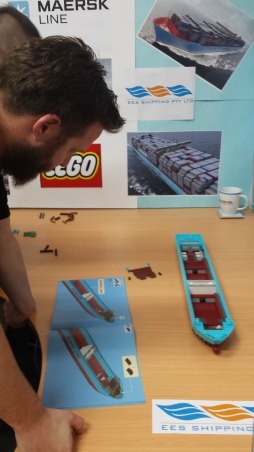 Next week we’re inviting some of our 20 staff members to lay their first lego bricks. 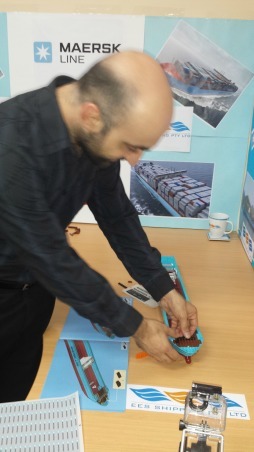 Did you know that the actual Maersk Mc-Kinney Moller is manned by 22 crew members? With a few more staff (and training of course) EES could effectively operate this massive vessel! Stay tuned next week for more updates. Would you like to come and give us a hand with this mammoth task? Drop us a line today.